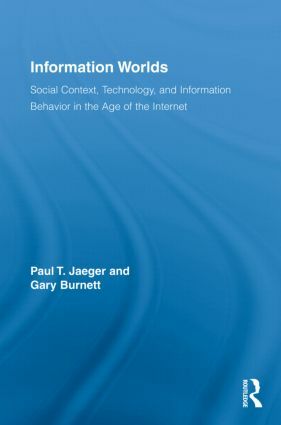 The authors present a multi-level theory of "Information Worlds" to investigate the ways in which information creates the social worlds of people. Building upon the foundational works of Library and Information Studies (LIS) scholar and theorist Elfreda Chatman and philosopher Jurgen Habermas, as well as from theory and research from a wide range of other fields, the theory of information worlds can serve as a theoretical driver both in LIS studies and across other disciplines that study information issues, enriching and expanding our understanding of the multi-layered role of information in society. Testing their theory through application to a variety of real-world issues, Burnett and Jaeger tackle the topics of libraries and information provision, the value assigned to information by differing social groups, information access and exchange, international information policies, the role of information in democracy, and technological change. Information Worlds provides a framework for empirical investigations into the fascinating and very real social dimensions of information. Paul T. Jaeger is an Assistant Professor in the College of Information Studies and Director of the Center for Information Policy and Electronic Government at the University of Maryland. He is also the Associate Editor of Library Quarterly, and the author of more than seventy journal articles and book chapters, along with six books. Gary Burnett, Ph.D., has been an Associate Professor at the College of Communication and Information of Florida State University since 1996. Dr. Burnett is the author of a book on the American poet H.D., and his research has appeared in a number of journals.